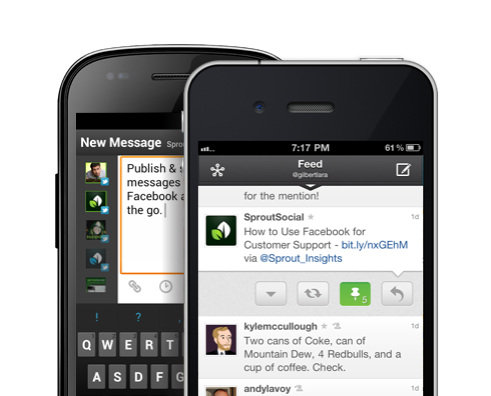 Don't miss a beat with Sprout Social mobile. Monitor brand mentions, schedule messages, assign tasks, and find new customers — just like you would on the desktop version. 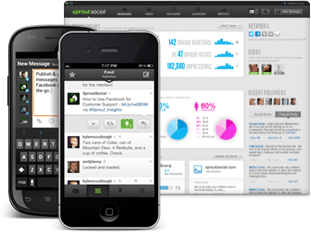 Don't miss a beat with Sprout Social mobile. For those that need to work on the fly, either on their own or with their teams, we offer both iPhone and Android apps that work seamlessly with our web platform. Monitor brand mentions, schedule messages, assign tasks to your team and much more! We have mobile versions of our application for both iPhone and Android devices. 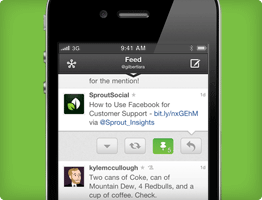 Our mobile apps will allow users and teams using Sprout Social to have a cohesive experience across multiple social networks, regardless of where they are or what device they are using. Packaged in an easy-to-navigate and sleek interface, our application gives you the freedom to hit the road and keep eye on your social media accounts.